The problem with a surprise is that you never know whether it’s going to be good or bad. 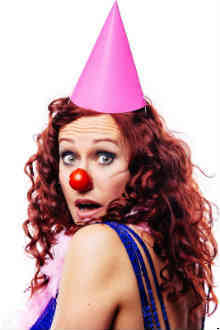 Christel Bartelse/Dutchgirl Productions’s The Surprise playing at the Factory Theatre Ante-chamber as part of the 2018 Next Stage Theatre Festival capitalizes on the unpredictable as the audience tries to help throw a surprise party for Ginger (Christel Bartelse). Sometimes there are works that defy good or bad and The Surprise is that type of show. I had a great time, but context is so important for something that relies so heavily on the audience. See, the premise is that the audience are the guests. Throughout the set-up, there are props handed out and instructions provided for how to behave at specific cues. And my audience was game for whatever Bartelse threw at them. Explain gifts? Eat chips? Give her a coat? It didn’t matter, they were on it. Bartelse, for her part, was loving the crowd. When they gave her something to work off, it was a sneak peak at her improvisational abilities. Too bad these moments were too far between. For a show that’s already quite short, there’s a lot of filler. Half the time the audience is expected to fill-in these moments as Bartelse runs helter-skelter trying to make the party perfect. Any time things start to pick up, exchanges are cut short and the audience is left to their own devices. The comedy, too, I found repetitive. Often the jokes were little more than Ginger getting some insensitive gift such as the wrong flavour of cake. There’s not much variation, until the guests jump in to play along. Again, Bartelse is charming and funny, but her momentum was killed by how she structured the show. There isn’t much in The Surprise and it’s hard to tell if that’s good or bad. Any longer, the very thin premise would drag but there’s just no material in the little that exists that I’m not sure I’d be so fond of the night if we hadn’t all been in it together. But I guess that’s the thing about surprises.